While Chappaquiddick doesn’t give new details about the events of that night it does portray Kennedy as a complex man. On the one hand, we see the somewhat ruthless politician willing to bend rules if necessary while on the other we see the little boy inside desperate for a father’s love. The month was July, the year 1969. In the middle of the month, two events would occur within days of each other that would not only have significance for the Kennedy family but would also captivate millions of Americans. The second event would happen two days after the first when Neil Armstrong walked on the moon fulfilling a promise the late President John F. Kennedy made to the American people nine years earlier. The first event, which occurred on July 18, 1969 involved another Kennedy – Senator Edward "Ted" Kennedy (Jason Clarke; Dawn of the Planet of the Apes) – when the car he was driving went off the road into a shallow pond killing his passenger, Mary Jo Kopechne (Kate Mara; Fantastic Four). Both incidences were significant and have followed the Kennedy name to this day. Senator Kennedy left a cottage on Chappaquiddick, Martha's Vineyard with Kopechne at 11:15 pm according to his statement. He then claimed he made a wrong turn on the way to the ferry and ended up driving off a one-lane bridge into Poucha Pond. Kennedy stated he swam free of the vehicle but that he couldn't find Kopechne. He then went back to the cottage to enlist help from his cousin Joseph Gargan (Ed Helms; The Hangover) and Former U.S. Attorney Paul Markham (Jim Gaffigan; Chuck). When they couldn't see anything due to the darkness, they urged Kennedy to report the accident and they left. What Kennedy did next may have killed an innocent (or maybe not so innocent) woman. The film follows Kennedy those next few days and all the mistakes that were made during that time. He told a reporter he had a concussion and his Dr. gave him sedatives (which would never happen), he wore a neck brace to Kopechne's funeral but turned his head displaying ample mobility, etc. Kennedy lawyers scrambled to have Kopechne's body released and buried without an autopsy and pushed for a hasty trial with little evidence despite testimony that Kopechne died from suffocation not drowning. In the end, Kennedy walked away with barely a scratch physically or politically and a young woman lost her life. Clarke does an excellent job of portraying the senator, showing a certain cockiness often displayed by a Kennedy while also depicting an unsure, insecure individual barely veiled under a well-practiced mask. Helms shows us he can do more than just comedy as Gargan grapples with the idea of wanting to help his cousin while not wishing to get caught up in the corrupt political machine. Mara, while not in much of the film makes an impact in the scenes she is a part of. The 1080p high definition video presentation is very good with lots of detail and clean lines. There are moments that utilize 16mm for a grainier "olden days" effect which works well to keep the audience in the mindset of the late 1960's. The DTS-HD Master Audio 5.1 is clear and solid and accentuates what I feel is a strong soundtrack. There is very little noise to be heard which supports the current technology but maybe would have been a welcome change given the time period of the film. There are only two extras in the set which run about 40 minutes total. The first – A Reckoning: Revisiting Chappaquiddick – is 25 minutes of some good interviews while the second – Bridge to the Past: Editing the Film – basically showcases editor Keith Fraase and Director John Curran's (Praise) reluctance to work with an editor he hadn't previously. While Chappaquiddick doesn't give us any new details about the events of that night and the days following it does portray Kennedy as a complex man. On the one hand, we see the somewhat ruthless politician willing to bend rules if necessary while on the other we see the little boy inside desperate for a father's love and approval that he will never get. The film does leave one with more questions than answers as well as giving one a bitter taste in their mouth for the injustice that obviously occurred. Well cast and nicely shot the film is an interesting peek into a bygone time and an event that is not only still remembered today but that changed the course of several lives. Download Chappaquiddick from the iTunes Store in Digial HD. 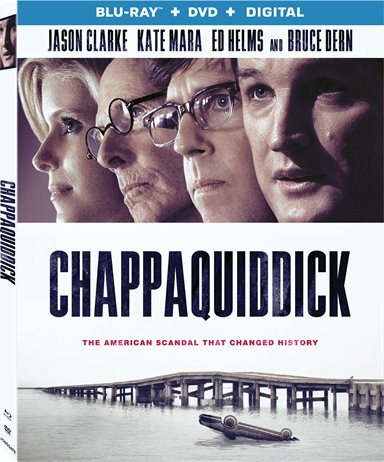 For more information about Chappaquiddick visit the FlickDirect Movie Database.